March 29, 2019, 1:20 PM · This fall violinist Simon James will join the San Francisco Conservatory of Music with a full studio, SFCM announced Thursday. James, whose students have excelled in numerous national and international competitions, is currently Second Assistant Concertmaster of the Seattle Symphony. "We are thrilled to welcome Simon James to our faculty," SFCM President David H. Stull said. 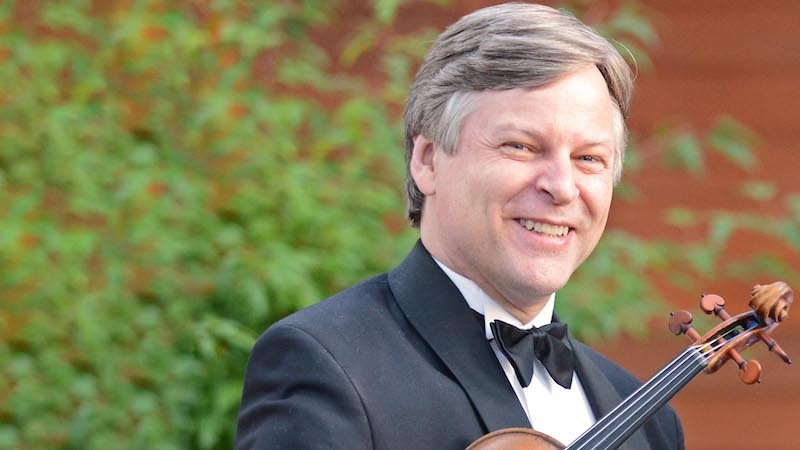 "He is an artist of exceptional caliber and his work as a teacher is evidenced in the many outstanding young violinists emerging within the field today. He will be a superb advocate for his students and I very much look forward to having him as a colleague in the years ahead." A native of Australia, James also is a founding member of the Australian World Orchestra and has been a member of the Melbourne Symphony Orchestra and Lincoln Center’s Mostly Mozart Orchestra. He is a graduate of the Manhattan School of Music, where his teachers included Erick Friedman and Syzmon Goldberg. For 10 years James has taught pre-college students at the Coleman Studio in Seattle, and the collective list of accomplishments among his students is impressive to say the least. They include winning the International Menuhin Junior Competition, Stradivarius International Competition, Stulberg International String Competition, Vancouver International Music Competition, MTNA National Competition, and being laureates at Spohr, Johansen, Il Piccolo Violino Magico, and Postacchini Competitions. James' students have been featured numerous times on NPR’s "From the Top." In addition to appearing with all the Pacific Northwest’s leading orchestras, his students have performed with the Detroit, Richmond, Utah, and Seattle Symphonies, the Liszt Chamber Orchestra, Berlin Koncerthaus Orchestre, Orchestre de la Suisse Romande, London Philharmonia, and on the Los Angeles Philharmonic’s Green Umbrella Series. James' students have gone on to study at the Curtis Institute, The Colburn School, Juilliard, New England Conservatory, Cleveland Institute of Music, McDuffie Center for Strings, Peabody, Thornton School of Music at USC, the Shepherd School of Music at Rice University, and the Royal Academy of Music among others. Studio alums have recently won positions in the New York Philharmonic, St Louis Symphony, and Minnesota Orchestra. James also has been guest-teaching this year at the University of Michigan and has taught at the Universities of Houston, Maryland, Texas (Austin), and Mount Royal University Conservatory in Calgary. He has also taught and coached at the Wolfgang Academy in Singapore, the Australian Conservatory Orchestra in Sydney, and the New World Symphony. This spring he will teach at both the Royal Conservatory of Music in London and the Royal Conservatoire of Scotland, and this summer he will teach at Center Stage Strings, the Cambridge and Liberec International String Academies, Encore Chamber Music Festival, and the Brian Lewis Young Artists Program.